Open Arts 2013 – Shire Hall Gallery. Last Friday saw me attend the preview of the Open Arts Exhibition 2013 at the Shire Hall Gallery in Stafford. It was part of my role as the Staffordshire Poet Laureate and I had the pleasure of reading my poem All around the Shire, to the gathered audience of Civic dignitaries, artists and their families and friends. The exhibition is a real showcase of talent that if you were ever in any doubt that Staffordshire lives up to its tag as the Creative County, then this exhibition will remove any of these doubts. Imagery and ideas are abounding in this eclectic mix of styles, media and subjects. As a writer I look for the secrets in a picture, the hidden corner, the darkened room, to lit room at 2:00am these are where the stories are, this is my entry into the picture that fires my imagination. The image can be abstract and still allow me to see the thoughts behind the face, the beauty in the moment. Of the winning images there were three that held such secrets, Blue David by Sam Mace – Mud Revellers by Ron Satterthwaite and LAT 52816393 LONG 2118802 by Yvonne Jordan. The Staffordshire Open Art Exhibition is on until 14th July at the Shire Hall Gallery, Stafford. Quadrophenia – Love Reign O’er Us. And so the weekend is here and the show will go on. There is a real buzz around the Assembly Rooms in Tamworth as the reality of what we are performing kicks in with the cast, as they perform for the first time with the live band on the thrust stage that had only previously been marked out with chairs. Wednesday saw a technical set-up, with the band sound check, the projections and members of the cast hitting their marks so that the lights can be set to hit the mark at the same time. This has been a lot of hard work from a dedicated group whose reward is two sell out nights in which to deliver our baby into the world. For those that have tickets then you are in for a real treat, believe me, I’ve seen it. In collaboration with Tamworth Library, I am running a Poetry workshop to celebrate to 40th Anniversary of the Library moving to its present building. The workshop is FREE to anyone over 16 and will run from 10am to 2pm. We will look at some unusual aspects of the library as selected by the Library staff to seek out what makes this library unique amongst the other libraries in the county. Participants will be given opportunities to explore the items and write about them, there will be a reading in the library of some of the poems as the end of the workshop. 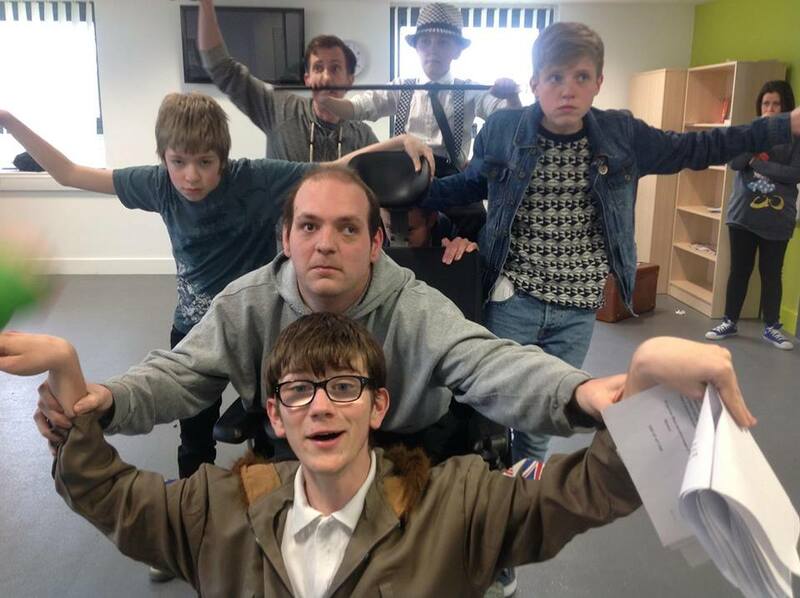 24/25th May Quadrophenia – Assembly Rooms, Tamworth. 4th June – Night Blue Fruit – Coventry. 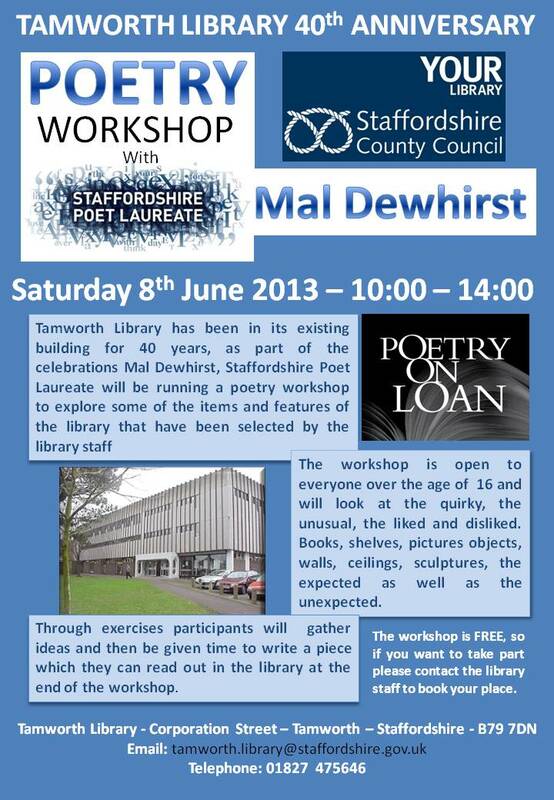 8th June – Laureate Saturday Workshop – Tamworth Library. 11th June – Kings Head Lichfield – with the Lichfield Poets. 21st June – Spoken Worlds – Burton on Trent.